Located in South Kildare between Athy and Kildare Town, and with fully wheelchair accessible ranges, Harbour House Sports & Shooting Club offer the opportunity for individuals and groups to participate in many different disciplines. The Club is open to visitors and also offers membership for those who wish to visit more often. So if you have ever wanted to brush up on your clay pigeon shooting game or try a new sport such as Archery (Harbour House has it’s own Archery Club), why not contact them to find out more! 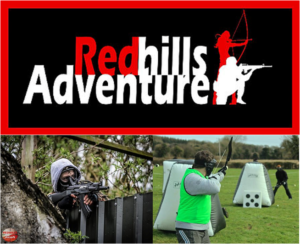 Red Hills Adventure is located just outside Kildare Town, County Kildare. The activities offered here are suitable for many different groups such as Family Groups, Birthday Parties, Corporates Groups, Stag and Hen Parties and School Tours. Individuals are not forgotten about either with regular open skirmishes being held. In Clane, in North County Kildare one of Ireland’s leading Outdoor Country Pursuits Centres, Abbeyfield Farm offers many different activities for all to enjoy. This picturesque centre welcomes all groups from corporate to families and friends to come and try something new in one of their many activities.